This rich make ahead casserole is topped with a crunchy, cheesy topping that is kind of like dumplings, but with more texture. Alfredo sauce, frozen vegetables, and precooked chicken make it easy. The last time I made it I used Havarti cheese instead of cheddar, and it was sublime. In heavy saucepan, cook onion in olive oil over medium heat until tender. Add flour; cook and stir 3 minutes. Add 1 teaspoon thyme leaves and milk; cook and stir until thick. 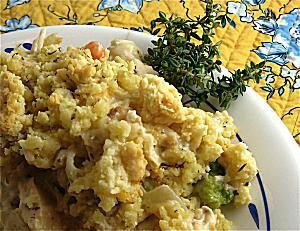 Remove from heat and add Alfredo sauce, chicken, 1-1/4 cups Cheddar or Havarti cheese, 1/3 cup Parmesan cheese, and the frozen vegetables; stir gently. Place in a 2-1/2 quart casserole. Cover and refrigerate 8 to 24 hours. When ready to eat, preheat oven to 375 degrees F.
Place casserole, covered, in oven and bake for 25 to 30 minutes until warm. Meanwhile, in small bowl combine flour, 1/2 teaspoon dried thyme leaves, baking powder, 1/4 cup butter, 1/2 cup Cheddar or Havarti cheese, Parmesan cheese, and egg and mix with a fork until crumbly. Uncover casserole and crumble this topping evenly over the top. Bake for 20 to 30 minutes longer, until filling bubbles and the topping is golden brown and crisp. You can also bake the casserole right away. After you place the chicken mixture in the casserole dish, top with the crumbly mixture and bake in preheated 375 degrees F oven for 25-35 minutes until bubbly and brown.